Hello Stampers! Welcome to another fun challenge over at Tuesday Throwdown. We are being sponsored by Lawn Fawn and they have generously given the DT beautiful clear stamps to use. This week's challenge is "Inspired by a Favorite Book." I am an avid seamstress/quilter and I love designing quilting patterns. I try to sew each day providing my shoulder lets me. It's been fun creating new things. 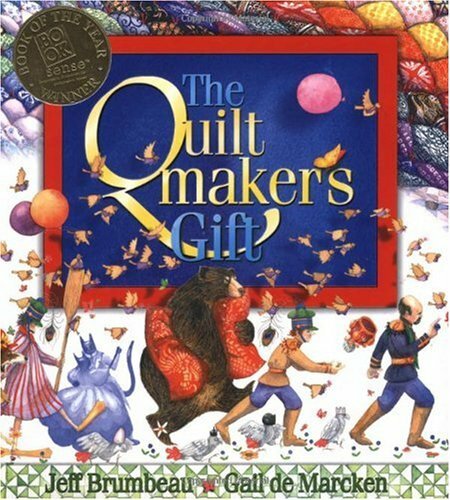 Years ago the book The Quiltmaker's Gift came out and I bought it to read to my children. 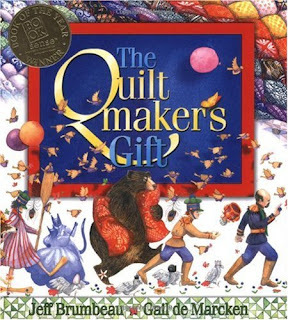 They loved the story behind it and the beautiful illustrations and quilts in the book. Now that my children are grown up, this book is packed up with our other favorite children's books. My card is based on a more modern quilt most know by the chevron design. I stamped the chevron in a darker shade of green to create a background for my cardbase. I stamped the flower and colored it in using Copic markers. The leaves are from an old retired stamp set I have laying around. I trimmed the leaves and placed them behind the flower. The flower is popped up with 3-D foam tape. The white shaped die is a Spellbinder's die. Last of all I added the buttons and the pink bow using waxy flax. That's all for me, please join the TT team over at our challenge blog for more beautiful inspirations and enter to win some fun stamps from Lawn Fawn. What a fresh, clean card this is. Love the addition of the tiny bow as well. Thanks for joining the Craft-Dee BowZ May challenge! The coloring and colors are just lovely! Your images goes great against the green background. Pops right out.